Food security in poor rural communities often relies significantly on flows of ecosystem services from 'natural' environments. For millennia mankind has engaged in thinking and learning experiences which have shaped the processes underpinning the production of food and the management of land, addressing multiple factors and tradeoffs. However, many food production systems require intensive management and are prone to failure outside of the range of their optimal environmental conditions. Concerns are growing about the ability of current agricultural systems to support rising human populations without further degrading critical ecosystem services (such as water provisioning, pollination). During extreme events, such as drought, or other shocks or crises (environmental, social or economic), the dependence of rural communities on ecosystem services to meet their nutritional and livelihood needs often increases. This highlights the importance of minimising the impacts of agricultural systems on ecosystems and the services they provide. Strategies for coping with food insecurity may, in turn, have an impact on the capacity of ecosystems to deliver ecosystem services as the spatial and temporal nature of feedbacks between socio-economic and ecological systems can be complex. 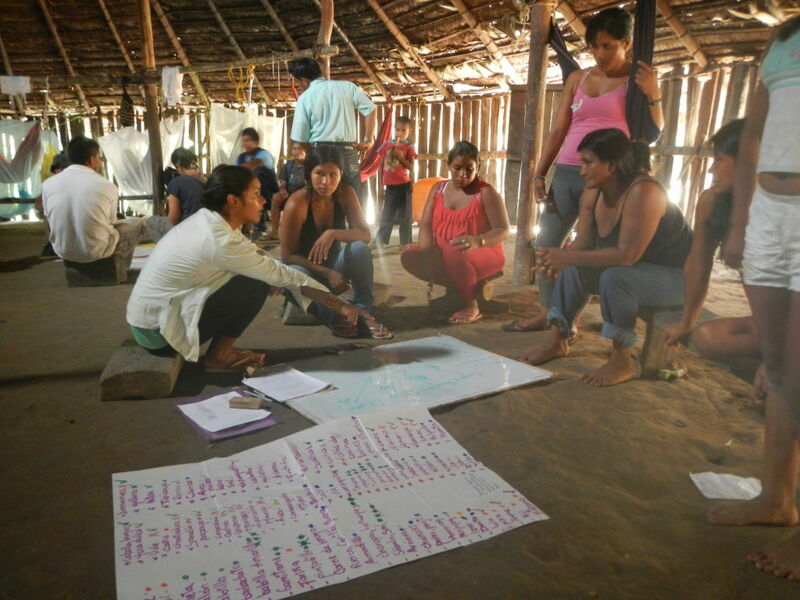 This project aimed to explicitly quantify the linkages between ecosystem services that affect - and are affected by - food security and nutritional health for the rural poor at the forest-agricultural interface. inform policy makers on how future land use and climate change will affect both food security and the ecosystem services associated with it. The science-policy interface: How can we manage ecosystem services to reduce food insecurity and increase nutritional health? Food insecurity is not necessarily a result of low production but of access, for example infrastructure, markets, and means to buy. Markets have become important food sources because they are available all year round with decent volumes andf diversity. But they are largely inaccessible to the resource poor. Fruit production and diversity is low, and this is reflected in the rarity of fruit in meals. There is a mismatch between knowledge and action - knowledge about environmental degradation is high, but there is inertia to take action by all stakeholders. Authors: Dobbie, S.; Schreckenberg, K.; Dyke, J.G. ; Schaafsma, M.; Balbi, S.
Authors: Maseko, H.; Shackleton, C.M. ; Nagoli, J.; Pullanikkatil, D.
Authors: Angarita-Baéz, J.A. ; Pérez-Miñana, E.; Vargas, J.E.Beltrá; Agudelo, C.A.Ruiz; Ortiz, A.Paez; Palacios, E.; Willcock, S.
Authors: Bax, V.; Francesconi, W.; Quintero, M.
Authors: Tsirinzeni, M.; Hudson, M.D. ; Parks, K.E. ; Bone, R.A.; Willcock, S.
Authors: Cruz-Garcia, G.S. ; Sachet, E.; Vanegas, M.; Piispanen, K.
Authors: Willcock, S.; Hossain, S.; Poppy, G.M. Authors: Francesconi, W.; Srinivasan, R.; Pérez-Miñana, E.; Willcock, S.P. ; Quintero, M.
Authors: H., Z.Duran; A., H.Arguello; Tapasco, J. Authors: Weyell, J.; Eigenbrod, F.; Hudson, M.; Kafumbata, D.; Tsirizeni, M.; Chiotha, S.; Poppy, G.; Wilcock, S.
Authors: Kafumbata, D.; Jamu, D.; Chiotha, S.
Authors: Villa, F.; Bagstad, K.J. ; Voigt, B.; Johnson, G.W. ; Portela, R.; Honzak, M.; Batker, D.
Authors: Poppy, G.M. ; Chiotha, S.; Eigenbrod, F.; Harvey, C.A. ; Honzák, M.; Hudson, M.D. ; Jarvis, A.; Madise, N.J.; Schreckenberg, K.; Shackleton, C.M. ; Villa, F.; Dawson, T.P. Authors: Villa, F.; Voigt, B.; Erickson, J.D. Authors: Ramirez-Gomez, S.O.I. ; Torres-Vitolas, C.A. ; Schreckenberg, K.; Honzak, M.; Cruz-Garcia, G.S. ; Willcock, S.; Palacios, E.; Pérez-Miñana, E.; Verweij, P.A. ; Poppy, G.M. Authors: Bagstad, K.; Johnson, G.; Semmens, D.; Villa, F.
Authors: Bagstad, K.J. ; Johnson, G.W. ; Voigt, B.; Villa, F.